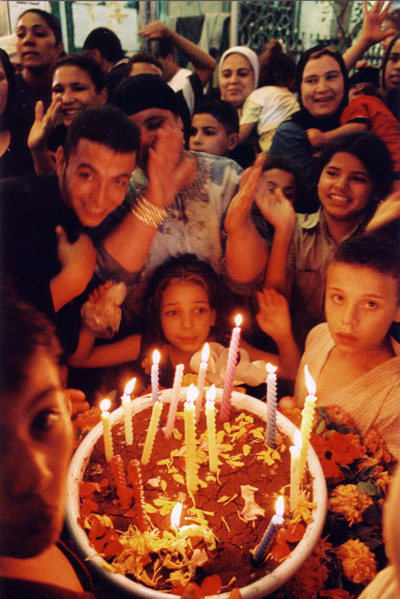 At some mawlids, like in this picture, henna is distributed to the people at the shrine is celebrated before the final night of celebration, a custom borrowed from wedding celebrations. The analogy with weddings is not a coincidence: A mawlid is often also called "farah", a festivity of joy, a word that also means wedding in Egyptian Arabic. On the one this is related to Sufi spirituality: mawlids are usually celebrated on the date of death of the saint because it is seen as the real birth of a mystic, his union with God. On the other hand, it is an indication of the festive atmosphere, for the prevailing emotion of a mawlid is joy: religious joy for the pious person whose memory is celebrated, communal joy of the people who come together in celebration, and profane joy for the many lights, sounds and attractions of the festival. For some Muslims, this moment is joy is problematic however. They believe that religion should be expressed by constrained and disciplined piety and should not be an occasion for listening to music and eating sweets. But the holy texts of Islam (the Qur'an and the tradition of the Prophet Muhammad) do not provide a clear judgement on the issue because it is not simple an issue of do's and dont's. It is a matter of different understandings of religion and the sacred. The people who celebrate mawlids see the sacred as a power, as an active grace pf God that can be expressed in many ways and encompass all fields of life. The people who criticise mawlids see the sacred as something vulnerable, an intellectual attitude that is at risk of being tainted at any time by, say, sweets and music.